Afterschool meals help to fight childhood hunger and make sure that all children have access to healthy options during out-of-school time. Afterschool programs keep young people safe, help working families, and engage children in learning—but they also can nourish young people during the hours when school's out. Afterschool meals are an effective way to reduce childhood hunger and promote a healthy childhood weight. In 2016, 15 million children (21 percent) under the age of 18 lived in poverty and were exposed to hunger. Afterschool meals are served in 21st Century Community Learning Center funded programs as well as other afterschool program sites. Be an Afterschool Meal Champion and help ensure that children in need have access to a nutritious meal during the afterschool hours. Making afterschool meals available helps combat the hunger and food insecurity that affects more than 15 million children in the United States. There is a federal program that can help you serve afterschool meals for free by providing funding for eligible children. Signing up is easy! Offering afterschool meals increases participation in afterschool programs. The availability of nutritious food improves effectiveness of enrichment activities. For every 500 eligible children participating, a program is reimbursed more than $250,000 in funding annually. The At-Risk Afterschool Meals Program through the Child and Adult Care Feeding Programs (CACFP) provides children and teenagers the nutrition they need, and can draw them into constructive activities that are safe, fun, and filled with opportunities for learning. The Afterschool Snack Program can be operated by school nutrition departments through the National School Lunch Program or CACFP. The Summer Food Service Program (SFSP) is a USDA-administered program designed to fill the nutrition gap left during the summer months and make sure children can get the nutritious meals they need. Our survey of afterschool and summer program providers shows that these programs are an important source of food for the kids they serve, and takes a look at the important role SFSP plays in bringing healthy snacks and meals to kids in need. Afterschool Meals AmeriCorps*VISTA project: In 11 states across the nation, AmeriCorps VISTA volunteers participating in a unique Afterschool Alliance project are working to extend the reach of afterschool programs in their states and communities. 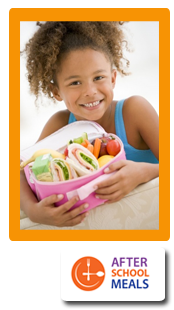 Afterschool Snack blog posts on wellness, nutrition and physical activity. National AfterSchool Association Standards for Healthy Eating and Physical Activity (HEPA) in Out-Of-School Time Programs: This document provides up-to-date, evidence-based, practical quality standards for providing children with healthy food, beverages and physical activity in out-of-school time (OST). The Y of the USA is a leader in helping children develop healthy habits afterschool and during the summer. Healthy Kids Hub from Healtrhy Kids Out of School, a project of Child Obesity 180. Healthy Eating in Out-of-School Time: The Promise and the Challenge: NIOST researchers use qualitative research methods to explore healthy eating concepts among OST program administrators, examined their perception of the importance of the childhood obesity epidemic in relation to their mission, and explored perceived barriers to serving healthful foods, and the potential utility of guidelines and other managerial supports in helping programs adopt healthy eating practices. Afterschool: Key to Health and Wellness for Pre-teens and Teens (2010): Our issue brief demonstrates how afterschool programs provide a place for youth to be physically active, while teaching them to make positive choices for themselves. The Afterschool Alliance's work in the anti-hunger, wellness and nutrition areas is supported in part by the Food Research and Action Center through the ConAgra Foods Foundation.